Juli Sanchis Aguado “HARCA” was born in Picassent-Valencia (Spain) in 1942. Growing up, Harca developed a love for drawing. At age 13, a teacher advised him to pursue his dream and enroll in the Academia de Bellas Artes in Valencia. He was only able to complete one year of studies, as his family needed his help to make ends meet. Even so, Harca maintained a devotion to his craft. A few years later, the director of “Raons”, a local magazine, asked Harca to sign on as a freelance contributor – giving birth to Harca’s humorous and satirical style. Since then, Harca’s work has appeared in numerous periodicals throughout Spain, including newspapers such as Pueblo, Levante and El Pais; and magazines like Vida Cooperativa, Agricultura Jove, Sao, Dos y dos, Camp Valencia, Cal dir, Consum, Valencia Semanal, L’Horta, El Corco, Objetivos, Generalitat, BIM Torrent, El Pardalot Engabiat, 7 Dies de la Comarca, Estudi, Lluita, Papers, Traure, Serveis Socials, La Golondriz, L’Eliana 2000, Dimension HUMANA, Musica i Poble, XOOOC PICASSENT , Valencia 7 dias, Abogada Espanola, PICA’M, nonada.es, FENAMIZAH, BOSTTONS themag. Harca’s cartoons have been awarded prizes at contests worldwide. He also provided animations for Spanish Television (TVE) programs “Els Nostres Arbres” in 1982 and “Terrorisme Fiscal” in 1983. In 2001, Harca published a compilation of his work La Etapa Negra (The Black Time). 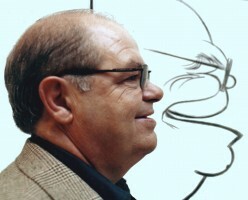 In 2011 published complilation of his work “Vull la Lluna”.Currently, Harca is the head of the FEderation of Cartoonists Organisations (FECO).